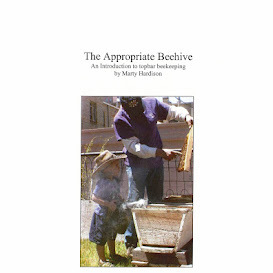 We've lent this to a fellow beekeeper two years in a row now. I'm wondering if this year he'll build one of his own. I doubt it, but now would be a good time since Labor Day is "traditionally" when we Coloradans harvest our honey. It's an "escape board," a chemical-free way to clear a super of bees overnight. In the afternoon when most foragers are still out in the field, the escape is inserted below one or more supers, maze facing downward. In the evening when it's time to rejoin the cluster, the bees go down the hole and encounter the maze. The tunnels guide them out in a fairly organized stream, but if the super is really full of bees, it may take two evenings to clear it of bees. That's a handy little device. I'll have to make one and try it on my Lang next year when I have some honey in the supers! Love the way you used it on your top bar.